Summertime, when my children were younger, meant it was time to visit our local zoo, Binder Park Zoo. I have many happy memories of taking Kirsten and Travis to the zoo. We would go to the zoo enough that we bought a yearly family pass. The family pass was about $35 a year in 1990 and we could go as many times as we wanted to each summer. Plus, it was accepted at other zoos across the nation. Binder Park Zoo is located outside of the Battle Creek city limits in Emmett Township, at 7400 Division Drive, Battle Creek, Michigan. The zoo is located in a densely, wooded area that includes wetlands. The natural beauty of the area has been preserved as much as possible. Kirk, Travis and Kirsten riding the rails! The parts of the zoo that our family enjoyed included seeing the monkeys, lemurs and zebras; riding the train through the woods, sometimes you could see the wolves from the train; eating dinosaur shaped chicken nuggets at Beulah's Restaurant, climbing the spider web in Miller's Children Zoo; and stopping at the gift shop on the way out of the zoo. Having the spider web all to themselves, a rarity. Unfortunately, the spider web is no longer at the zoo. Peacock strutting its' stuff, Travis isn't too sure about turning his back on it. Kirsten is smiling pretty. The zoo was/is a great place to take visitor's as we did when my niece, Brianna; sister, Nancy; and brother-in-law, Scott visited. Travis, Myself, Brianna, and Scott feeding the goats in the children's part of Binder Park Zoo. Kirsten, Brianna, and myself-another photo op. Summer Zoo Camp was another favorite part of our summer. Kirsten and Travis would sign up for five mornings of fun at the zoo that included seeing the animals, playing games, creating art projects, and more. They would receive a t-shirt and make a name tag out of a slice of tree bark, which I still have. The zoo is open to visitors from April to October, but offers other activities throughout the year. Zoo Boo is held for two weeks at the end of October. The zoo is decorated for Halloween and children can walk through the zoo and trick or treat. Education is a big part of Binder Park Zoo and one way they take the zoo to the community is through the Zoomobile. The Zoomobile will visit local classrooms, and senior citizen facilities and share their resources in a classroom or assembly setting. Binder Park Zoo is one of Battle Creek's treasures, it is a great place to spend the day. I know we spent many days there as our children were growing up. 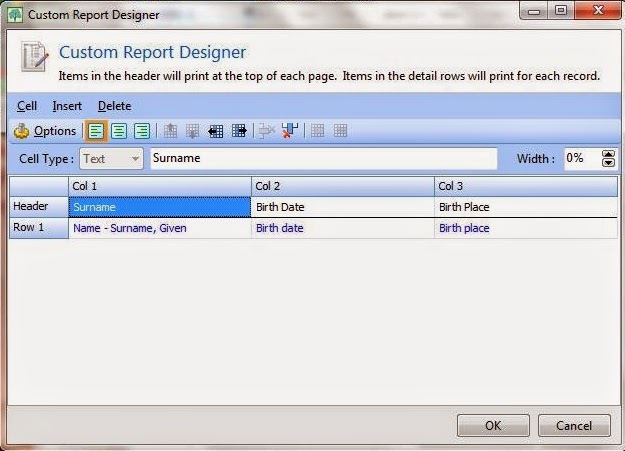 Roots Magic is my genealogy software of choice and one of the things I enjoy about using it is its' Custom Reports option. I used Custom Reports when the 1940 Census images were released. I have created Michigan Deaths, 1921-1952 reports, specific county reports, and more. 5 June 1917-Men who were between the ages of 21 and 31 registered during this draft. 5 June 1918-Men who had turned 21 since the first draft registration registered on this date. 12 September 1918-Men who were between the ages of 18 and 45 registered at this time. Click on 'Reports', then 'Custom Reports'. In the Header row, add the heading you would like on your report. I used: Surname, Birth Date, and Birth Place. Click on the box under 'Name' in the Row 1 row. In the field box above, select Name-Surname, Given. Click on the box under Birth Date. In the field box, select Birth Date. Click on the box under Birth Place. In the field box, select Birth Place. Click ok. Note: This is how I did my report. There are many options in the Field section, if you want to add other facts to your report. Next, select "Choose from List". A new window opens. Select "Mark Group" and "Select people by data fields". A search for information box opens. Enter search parameters in the boxes. A box will open and you can label your report. I labeled mine "World War I Draft Registration". You can use this report to look up World War I Draft Registrations at ancestry.com. I didn't worry about country of birth as all of my ancestors were in the United States by 1850, but you may want to add that to one of the search parameters to weed them out. Are you a Roots Magic user? How do you use Custom Reports? 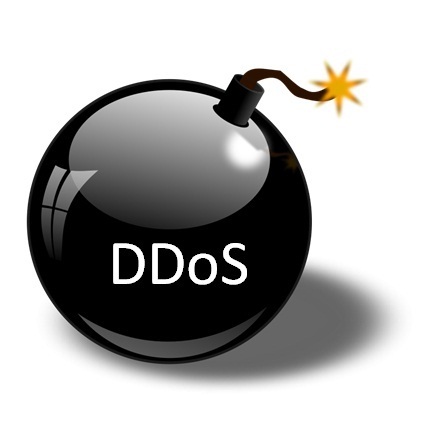 I am sure by now everyone has heard that ancestry.com suffered a DDoS (Distributed Denial of Service) attack. Most everything is back to normal at ancestry.com now, but when it wasn't available I read a lot of grumbling about it being unavailable. I chose to take a different approach. Ancestry.com is a great resource for those of us doing genealogy research, but it isn't the only option available to researchers. Plus, not everything is online. I decided to go off-line! During the last few months, I put folders on the desktop of my computer as a sort of to-do list and decided it was time to tackle the folders. My folders consisted of pictures that needed to be labeled, record copies that needed to be attached to my Roots Magic genealogy program, my Roots Magic to-do list, a document of summer genealogy road trips to be taken, and notes of ideas gleaned from the SCGS Jamboree 2014 live streamed sessions. I started with the picture folders. I opened each folder, opened the pictures using Windows Live Photo Gallery, clicked edit, and renamed each picture. The advantage of using the photo gallery is after you rename it you can use the arrow to go to the next picture. After all the pictures, hundreds of them, were renamed I moved each picture to its' final folder. 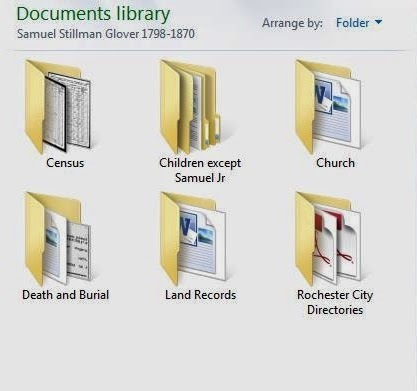 Inside each ancestor's folder I have sub folders for birth, marriage, death, military, census, etc. One folder is labeled 'children'. 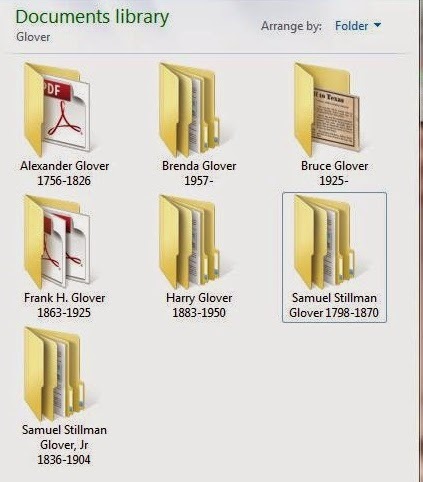 This folder has the children of my ancestor, one folder for each child, organized the same as the individual folders. The photo's were renamed and organized and I moved on to the records I had saved. I am trying to go paperless and when I see a record image in my online research I save a copy. I record and source the facts to my genealogy software program as I research, but save the images to be attached later. I didn't have as many record copies as I did photographs, so this didn't take too long. Next, I moved on to the notes of ideas from the lived streamed sessions of SCGS Jamboree. As I watched the sessions I would jot down ideas that I had from the information provided. For example, I watched Paula Stuart Warren's Manuscript Finding Aids session and thought of manuscript papers I would like to look for. One is Michigan Governor Josiah Begole, a first cousin five time removed. Another is Anna Glover paper's. Anna Glover wrote Glover Memorials and Genealogies: An account of John Glover of Dorchester and his descendants (Boston: David Clapp & Son Printers, 1867), and I would like to know her research notes or sources are available. I found a few manuscripts with Josiah Begole's name at Bentley Historical Library, University of Michigan, Ann Arbor and at Clarke Historical Library, Central Michigan University, Mt. Pleasant, Michigan. I added those to my Roots Magic To Do list. Lastly, I looked at the list of summer genealogy research trips I would like to take. I decided I would go to Ypsilanti, Michigan first to do a little Glover research. I worked on a research plan for this trip. Next, I created a list of places I would like to go to. I plan to go to two cemeteries and Historical Society of Ypsilanti Archives. If time, a visit to the courthouse or public library may be added. This will be a day trip as I only live 90 miles from Ypsi., as the locals call it. I used online resources to compile a list of what grave-sites I want to visit. The gravestone pictures are on Find a Grave, but as people are touchy about the use of their photographs, I want to take my own. Another list was compiled using the online resource of the Ypsilanti Historical Society, which I plan to write a separate blog for. The list above kept me busy and I didn't even miss ancestry.com. My desktop only has one folder on it now, down from about 12. How did you handle the ancestry.com outage? Vinera Eglantine (Powers) Glover Dies Leaving Ten Children-What Happened to her Children? The start of the new year in 1847 was an emotional one for my third great grandparents, Samuel Stillman Glover, Sr. and Vinera Eglantine (Powers) Glover. Vinera Eglantine (Powers) Glover gave birth to twins, Henry and Polly, the 15 January 1847, at the age of forty five. Henry and Polly were her 11th and 12th child. Vinera was 44 at the time of the twins birth. I imagine the shock she must have had when she delivered twins. Unfortunately, the next month was a tough one for Vinera and her family. Henry lived nine short days, dying 24 January 1847. Polly lived for 16 days, dying 31 January 1847. I imagine the grief that Vinera and her husband, Samuel Stillman Glover must have felt. It wasn't the only grief that Samuel would be feeling. Vinera died shortly after this on 14 February 1847, just short of a month after giving birth to her twins. Samuel would lose another child, Sarah Eglantine Glover, in two years on 23 January 1849. Vinera left Samuel and her ten children in the care of Samuel, which must have been a shock to him. I hope it was shock which led to the next few years in Samuel's life, as I don't know if I can understand the choices that Samuel made during this time. Within three years Samuel is remarried and living in Webster, Monroe, New York. He is living with his new wife, Maria, and her five children. Only two of Samuel's ten children, Alanson and Daniel, are with Samuel in New York. This made me wonder what happened to his eight other children. I needed to know and set about searching the 1850 Census for them. William Powers Glover, age 32, is living with his wife, Almira and son, George in Adrian, Lenawee, Michigan. Samuel Worcester Glover, age 29, is living in Springfield, Massachusetts. Sarah Eglantine Glover, died on 23 January 1849, at the age of 22. Alanson D. Glover, age 20, moved with his father to Webster, Monroe, New York. Dennis H. Glover, age 19, is living with his wife, Caroline, and son, Frank, age three months, in Oceola, Livingston, Michigan. The remaining five children are under the age of 15 and this is where I am curious about the choices Samuel made for his children. Samuel Stillman Glover, Jr., age 15, is living at the residence of John Cody, merchant, in Ypsilanti, Washtenaw, Michigan. Samuel Jr. is enumerated on his own line in the 1850 Census. The Cody family is beneath him but their dwelling and family numbers are the same. Who is John Cody? Daniel W. Glover, age 13, is living with his father, Samuel, in Webster, Monroe, New York. Vinera Josephine Glover, age 10, is unaccounted for. She is not with her father or any of her adult brothers or sisters. She isn't with Samuel Jr. either. Where did she go? I have tried in vain to find her in the 1850 Census. She marries Wm. P. Paine in 1857 in Ionia County, Michigan. How did she get to Ionia and meet Wm. P. Paine? George W. Glover, age 8, is unaccounted for. I have no further information on George W. Where did he go, he was only 8? Why would a father leave his young son behind? Did George die before his father left for New York? Annette Glover, age 6, is living with the Hiram Day family in Ypsilanti, Washtenaw, Michigan. Who is Hiram Day? Annette wasn't even three years old when her mother died. Annette Glover married Jesse Youngs, at the age of 16, in Wayne, Wayne, Michigan. I have so many questions that I would like answered. Oh, Samuel, why did you do what you did? Samuel's marriage to Maria Winegard presumably ended in divorce. Maria is found in the 1860 Census living in Webster, Monroe, New York with a marital status of widow. Samuel is still alive at this time and living in Rochester, Monroe, New York, where he lives until his death in 1870. To my knowledge Samuel never lived or owned land in Michigan after 1849. Do you have any information about Samuel Glover or his children? Please leave a comment, I would love to know what happened to Samuel's and Vinera's young children. Where in the World is Daniel C. Fenn? Daniel C. Fenn, my second great grandfather has been a challenge to research. I haven't been able to find his birth date or birth place. I believe it to be in Vermont as that is where his parents were living in 1820 and 1830. I don't even know what the C stands for! I can't find Daniel C. Fenn in the 1840 Census, he would have been about 17 years old. Daniel's father, Daniel Fenn, died in 1836, and I searched for his mother, Huldah (Rowley) Fenn, in the 1840 census to no avail. I searched the 1840 Census records for Daniel's brother's (Tully and Orlo), to see if Daniel or his mother were living with them at the time. There were no members of the family of the right age group in these census records. Another source of frustration is his death. The only record of death I have is from his daughter's, Hattie Fenn Glover, Bible. I have not been able to find a death record for Daniel. Daniel was living in Jackson, Michigan in 1871 according to the Jackson City Directory. His occupation was a traveling agent. Did his job take him out of Jackson county? If so, where? Michigan? Ohio or Indiana, which isn't too far from Jackson, Michigan? Additionally, I cannot find his place of burial. I am not the only one working on this. Another Fenn researcher has been trying to find out more about Daniel C. Fenn too. The above chart shows where there are gaps in my research and this is one of the reasons I like making charts and tables. Any suggestions of where I should look next? Please leave a comment. Michael LeClerc, chief genealogist at Mocavo, will be the featured speaker at the 2014 Abrams Foundation Family History Seminar, July 18th and 19th in Lansing, Michigan. The Archives of Michigan and the Michigan Genealogical Council are the hosts for this two day seminar. The seminar kicks off with two tours of the Archives of Michigan, at 12:30 and 1:00 p.m. on Friday, July 18th. Seminar go-er's will have six sessions to choose from Friday afternoon. Additionally, the Archives of Michigan will be open for research 1 p.m. to 5 p.m. on Friday and 10:00 a.m. to 4 p.m. on Saturday. Registration is required for the Seminar. The cost to attend the two day seminar and Saturday's lunch is $50. For more information on sessions and speakers, please go to the Seeking Michigan website. My nephew, Lord Stanley, is one today. Happy Birthday, Lord Stanley! 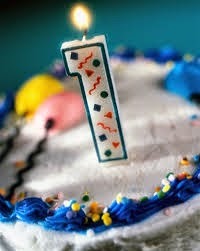 I wish I could be there to see you enjoy your first birthday cake. I bet you are having a great time today. I was able to spend some time with Lord Stanley and his sister, Cutie Pie, and their parents last fall. I loved it. Lord Stanley was such a happy baby. My favorite time with Lord Stanley was after his bath, his Dad would get him ready for bed. He smelled so good. Good enough that when I got home I went out and bought the lavender baby lotion that they used for myself. After he was swaddled, his Dad handed him to me and I would feed him his bottle and watch him fall asleep. It was a wonderful feeling. During my visit with Lord Stanley and his family, I got to enjoy Halloween with him. He was Sebastian the Crab, from The Little Mermaid. Cutie Pie was Ariel. I'm not sure what Lord Stanley thought of the whole experience as he was only four months old, but I enjoyed it. Lord Stanley has had a lot of cute moments and it was hard to pick which ones to share with you, but here are a few from his first year. He would kick and kick to get the music to play. Look at all that dark hair and great grin! Workday Wednesday: Kirk Leyndyke Retires after 39 Years in Education! My husband, Kirk, is officially retired after 39 years in education, the last 27 as an elementary and middle school counselor! Congratulations, Kirk! You survived all those little munchkins! I know you made a difference in many, many children's lives and have made the world a better place because of your kind and caring personality. I remember asking Kirk, after an unusually tough day dealing with a custody issue, where the police came and removed the child from the school, how he does what he does? He said, "He wants to be the one who is there for them." He has been there for thousands of students and parents throughout the years. You deserve a wonderful retirement and I am happy I will be here to share it with you. Here are a few moments from Kirk's career. Kirk was a counselor in every Lakeview building except the high school. The schools were Riverside Elementary, Minges Brook Elementary, Territorial Sixth Grade School, Westlake Elementary, Prairieview Elementary, and Lakeview Middle School. Kirk received the Elementary Counselor of the Year Award while counseling at Riverside and Minges Brook Elementary Schools. Below are a couple of pictures and the school board recognition for his award. The students always enjoyed seeing the staff dressed up for Halloween. Kirk is Robin Hood, tights and all. During the first few years Kirk was at Lakeview, he received a pink slip. A pink slip is notification that you won't have a job for the following year due to budget restraints. The staff at Minges Brook thought it would be funny to give him a real pink slip! Luckily, he had a job the next year after a millage passed. Quest Bear Guess Who? The Quest program was a self esteem building program and the Bear was its' mascot. I guess being a self esteem mascot falls in the job description of the counselor. Kirk had fun with it. One of the programs that Kirk developed in the elementary schools was a cultural awareness program. He held a Cultural Awareness Fair each year. Parents and students from various cultures would bring relevant items and costumes to show the students. The picture above shows the cultures of Korea, Italy, India and Japan. If Kirk is remembered for only one thing during his time at Lakeview, it will be for his career days. He would plan awesome career days. Parents would be invited to share their career with the students and Kirk would fill in with community members. The most talked about Career Days were when he had the Drug Enforcement Helicopter land on the school lawn. Above, parents are signing in at Westlake School. The culmination of Kirk's career came when he received his second state award. This time it was the Heart of Gold award. This award is given to a school counselor who has a Heart of Gold. This award was meaningful to Kirk because he was nominated by the students for this award. The picture below is Kirk, his award, and some of the students who nominated him. Kirk had many wonderful moments as a teacher and counselor. I could write a blog just on his experiences in education. I tried to capture a few above, but I have many more pictures I could have share. Throughout Kirk's years in education he has seen many changes. The one constant in his career were the students. He really cared about the students. He was available for them throughout their school career and beyond. He loved what he did. He made a difference in thousands of students' lives and for this he deserves a great retirement. Congratulations! Source: Manistee News Advocate-Manistee Daily Advocate, (Manistee, Manistee, Michigan), 24 February 1933, page 3; column 6, microfilm owned by Manistee Public Library; Manistee County Historical Museum, Manistee, Michigan. 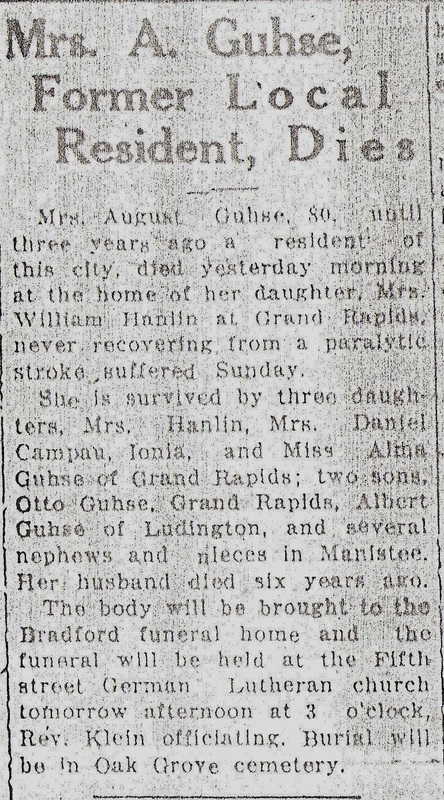 Mrs. August Guhse, 80, until three years ago a resident of this city, died yesterday morning at the home of her daughter, Mrs. William Hanlin at Grand Rapids, never recovering from a paralytic stroke suffered Sunday. She is survived by three daughters, Mrs. Hanlin, Mrs. Daniel Campau, Ionia, and Miss Alma guhse of Grand Rapids; two sons, Otto Guhse, Grand Rapids, Albert Guhse of Ludington, and several nephews and nieces in Manistee. Her husband died six years ago. The body will be brought to the Bradford funeral home and the funeral will be held at the Fifth street German Lutheran church tomorrow afternoon at 3 o'clock. Rev. Klein officiating. Burial will be in Oak Grove cemetery. Mrs. August Guhse is Ottilie (Fredrich) Guhse, the daughter of Christoph Fredrich and Susanna Koenig. She was born July of 1851 in Prussia. She immigrated to the United States in 1872 with her mother and sister, Amalia. Ottilie Fredrich married August Guhse on 28 October 1873 in Manistee, Manistee, Michigan. Ottilie and August had five children, Otto, Emma, Mary, Alma and Albert. Blogging is a great way to get the word out about your ancestors. It is even better when your readers are 'cousins'! How do you reach new readers and, hopefully, readers who are researching the same family members? This was the question I posed to myself about a month ago, when I decided to analyze my blog and create a plan for better use of social media. I am not a social media guru, so I went to an expert, my daughter, Kirsten. Kirsten is a Chicago based social media strategist and creative copywriter for a few national beauty brands. I 'hired' her to come up with a social media analysis for me concerning my Journey to the Past blog. I received eight pages of analysis on ways to expand my reach by using social media and blogging. Kirsten's analysis has been very helpful and I am still implementing her ideas. 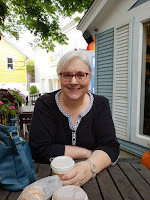 Kirsten felt my blog was in pretty good shape and the keys to expanding my reach was going to come from a more integrated social media approach. She suggested using all the platforms that fit right for me and posting content more frequently. What does this mean? Kirsten broke her analysis down into parts that she felt would get me the best results. Here are her suggestions, she had compliments too, which I haven't shared. Kirsten suggested I post more consistently. I agree, this has been a struggle the past few months as I haven't been blogging as much as I would like. She suggested I add buttons/links to my social media sites. I added Facebook, Twitter, Pinterest, and Google+ buttons to the left side of my blog home page. Clicking on these icons will take you to my social media sites. Check it out! Next, she suggested that I always share my new posts on my social media sites. Good suggestion as I am not consistent with this either. Renaming my images before I add them to my blog post was suggested so that the images will be searchable in google images. Ex: IMG 4510 should be replaced with Bruce Glover's Childhood Home Hazel Park Michigan Genealogy etc. Lastly, she suggested I leverage guest bloggers. Kirsten, you still owe me one! If anyone would like to guest blog, just leave a comment. I would be delighted to have you guest blog. Kirsten shared with me information on Facebook engagement and algorithms which bloggers probably don't think about, so it was good to try to understand how Facebook works for pages. I have a Journey to the Past page. (Please like me!) I wasn't using it very well and Kirsten helped me to make better use of it. I needed to add a cover photo, change my page type from a personal one to a writer, instead of a community. I beefed up my about section, too. Other suggestions included, posting my new blog posts every time, sharing links of genealogical interest, writing a blog post about my Facebook page, and posting my blog posts to my Fredricks Genealogy Group page, which I started and am the administrator for, when it applies to that family. Add photo's to Facebook posts. Posts with photo's get more engagement and do better in Facebook algorithms. Be funny! I have a sense of humor, but I don't always show it in my writing. This is something I will have to work on. Comment on other pages and brands as my Journey to the Past page, not as myself. I didn't know this was an option and had Kirsten walk me through it. Aim for 2-3 posts a day. I am doing this using Hootsuite, which I will talk about below. I have been using twitter since March of 2009. Twitter and Facebook are the social media sites I am the most comfortable with. One suggestion Kirsten had was to share photo's on twitter. Additionally, to keep tweeting my new blog posts, and retweet things I find interesting in the genealogy field. Implement Hootsuite. I had an account, I just wasn't using it to its' full potential, sometimes not at all. Hootsuite is a social media management dashboard. Since Kirsten gave me a tutorial on it, I use it to schedule posts to twitter, facebook, and google+. I monitor my twitter account for mentions, retweets and scheduled tweets. Two Facebook sections are set up. One for Journey to the Past and , one, for Fredricks Genealogy Group. I can see my news feed, wall posts, stream posts, private messages and scheduled posts. Hello, my name is Brenda and I am addicted to Pinterest. I love Pinterest. I have 124 boards and counting. I already had Genealogy themed boards, but wasn't using them as effectively for promoting my own blog posts. Kirsten suggested I pin my blog posts to boards on Pinterest. Slowly, I have been going through my past blog posts and pinning them to Pinterest boards. It is always fun to see what other boards my blog posts have been pinned to. You can find my Pinterest board by clicking on Pinterest above, or searching for BrendaLeyndyke. I have an instagram account but I have been using it to see what my daughter, niece, son-in-law, etc have been sharing. I don't even know if I have shared a picture, yet. Kirsten suggested I start using it to leverage more engagement and to find a new audience. I haven't started to implement her instagram suggestions yet. I left this icon off of my blog home page until I get it up and running, better. Kirsten even gave me post ideas for instagram and using hashtags, adding locations, and announcing new blogs. This is a synopsis of the analysis Kirsten did for me. She didn't want to accept any money, but I valued her expertise enough not to take advantage of her. I sent her a Sephora gift card for all her hard work. Have you ever done an in depth social media analysis of your blog and social media? I can recommend a good analyst, Kirsten! I learned so much from this experience. I realized one thing while implementing Kirsten's suggestions. It takes a lot more time than I thought it would. Social Media and Genealogy seem to be a good fit. I look forward to making new connections through my improved use of Social Media.